This "Hammer In" event will include hands-on experiences that aim to teach the public about this trade from those who are still practicing to this day. John Deere’s historic site in Grand Detour, Illinois is set to celebrate the blacksmith’s history and trade between August 4 and 5 with an event called “Hammer In 2018.” At the event, dozens of blacksmiths from around the Midwest will congregate to provide demonstrations, sell their work, and educate the public on the trade. Other tradesmen and women will also be on the premises to exhibit their skills and sell wares, including basket weavers, broom makers, trappers, wheelwrights, and woodwrights. The event is free, and visitors will be able to attend from 9 a.m. to 4 p.m. on Saturday and Sunday. 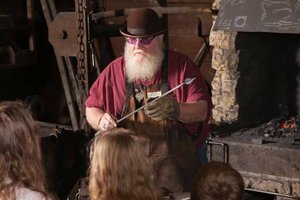 Attendees aged 12 and older will be able to get a hands-on experience, with the opportunity to hammer and forge their own piece of ironwork. Attending blacksmiths will help individuals train and experience the working side of the anvil. “Hammer In” events have been hosted every other year at the John Deere Historic Site since 2004. Those interested in participating in this year’s event can contact the John Deere Historic Site in Grand Detour.